This picture. When I saw it, I was completely undone. I sat in silence and quietly wept. Mary, utterly exhausted and disheveled from the strenuous task of child birth. Joseph, overwhelmed and in disbelief as he stares into the face of the seemingly impossible task of raising Heaven's child as his very own. And Jesus, fully divine with resurrection power coursing through His veins, yet absolutely helpless and reliant on his earthly parents for His every need. Painful screams of labor piercing the stillness of the night. The pungent stench of dirt and animals filling the air. Inescapable feelings of loneliness and inadequacy for fulfilling God’s purpose. And the newborn cry of the Child King, Emmanuel, God with us, Who forever changed history. The holy family was miraculously complete. Yet there was no fanfare, no celebration, no one to tend to the new mother or reassure the new father or care for the Christ child. Even those whom God had given a personal invitation to be a part of this extraordinary night turned the family away. Their journey had been long and their burden weighty, and after literally giving birth to God’s will for their lives and to hope for all mankind, they were all alone, overcome by both wonder and uncertainty. As I looked at this picture, my heart was wrought with many emotions, yet encouraged and wrapped in hope and peace. First, God’s will is often difficult, messy, intimidating, and overwhelming. It isn’t often wrapped in neat packaging and tied with a brilliant bow. It isn’t without challenges, set-backs, impossibilities or intense seasons of battle. There will be painful screaming in the middle of the night as His plan unfolds. The air may be nauseating and surroundings ill-fitted for a mighty work of God. There will be moments, and even seasons, of loneliness and inadequacy that dramatically overshadow the clarity of His purpose for my life. For as is visible at this first Christmas, darkness ambitiously chases light. Yet in the midst of it all, His hope still shines as brightly today as it did that night in Bethlehem. Believe in the God of impossibility to accomplish everything for which you’ve been created and set apart. Next, there are divine opportunities for obedient response all around us. Oh, how my heart aches for those who chose to forfeit their personal invitation from God to witness His coming to earth through the birth of His Son! Perhaps they had a legitimate excuse for not getting involved that night. Or maybe they were afraid of stepping outside of their comfort zone and into the drama of someone else’s life. Or they thought that their resources for meeting the family’s needs were lacking, or, they just flat out chose to be selfish and unwilling to share them. It’s possible they simply didn’t want to be bothered with the responsibility and inconvenience of serving someone else. Whatever the reason, an opportunity to not only witness but be an active participant in a miraculous movement of God was missed, and I have to believe that their lives were tragically never the same. When we say “no”, “not yet” or “not me” to a divine opportunity, I am neglecting my responsibility to play my appointed role in God’s grand production – His will manifest on earth. No one can play my part for me, and to turn Him away not only leaves a void in the life of someone else, but it prevents my own spiritual growth and receipt of God’s blessings. When a personal invitation is extended to me by the God of the universe, I must accept it. Finally, I have permission to be human. When I see Mary and Joseph, I see two people living out pure, raw obedience with a visceral, human response. It’s a beautiful portrait of real life lived in the presence of a real God. I have to wonder if gazing into the face of heaven laid in a dirty trough was glimpse enough of heaven to convince them to persevere; that their God was not only the almighty Great I AM of the past but also their personal Great I Am of the present and the future to come. And that amidst the questions and doubts and confusion, there was inexpressible joy and peace and comfort and hope and freedom found in simply being in the intimate presence of their God, tiny and helpless as He was. 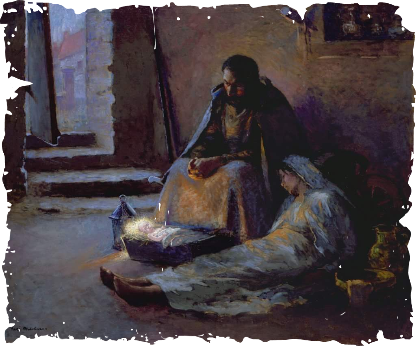 There was no pretense after having just delivered the Son of God; rather, Mary and Joseph allowed themselves to simply be - weary and worn out, abiding in His presence. What a gift I have been given to know God personally and to be known and accepted just as I am by a Savior Who was born through the merging of holiness and humanity. Instead of a palace abundant with amenities, God chose His Son to be born into humility and need. Like any gift, I have the choice of whether or not to receive it. This Christmas, I choose to receive the greatest gift – Jesus Christ. As I once again reflect on the richness of this picture, my spirit is moved by a fresh revelation – that God Who needs nothing and Who could accomplish His will apart from Mary and Joseph, invited them in their imperfection to be a part of His plan of redemption. When God could have chosen royalty to bear and raise the Child King, He instead chose an ordinary man and woman to change the world through their willing obedience. Their burden became their blessing. Their pain their greatest purpose. Their fear the source of freedom. And their struggle the means to their salvation. So this Christmas, I'm choosing to, like Mary and Joseph, be undone. And I encourage and challenge you as my own heart as been to see Christmas differently. To see not a picturesque nativity disconnected from your reality, but instead to see yourself in the stable in the presence of your Savior. Draw near to Him. Peek into the trough and look upon His face. Grasp the tiny hands that would one day raise the dead, heal the blind, and be stretched out on a cross. Recognize that while He is God, He is also human, just like you. Offer the Christ child your burdens and your pain, your fears and insecurities. And be encouraged that just like Mary and Joseph, God is calling you to respond to Him in obedience. To receive His personal invitation to be a part of a miraculous movement of God. To take a risk. To get involved. To sacrifice. To answer the call and go. "Lord Jesus, I acknowledge that all of my human efforts have fallen short of everything You are. I recognize that I am a sinner, and You are my Savior. I believe that You were born to die for me, and that You rose from the grave to forgive my sins and transform me into a new person from the inside out. In You, I am now a new creation whom You have purposed to do great things. Jesus, come into my life, forgive my sins and save me, because I cannot save myself. I place my trust in You alone for my salvation, and I accept your gift of eternal life." If you prayed this prayer, I want to know! There is no greater honor I could have than to celebrate your decision and walk this new life journey with you. And, I want to help connect you with other people who have made this decision and provide you with resources to help you grow in your new-found faith in Jesus Christ. Leave a comment with your email address, email me personally at heather@ovworship.com or send a Facebook message. I cannot wait to hear from you! 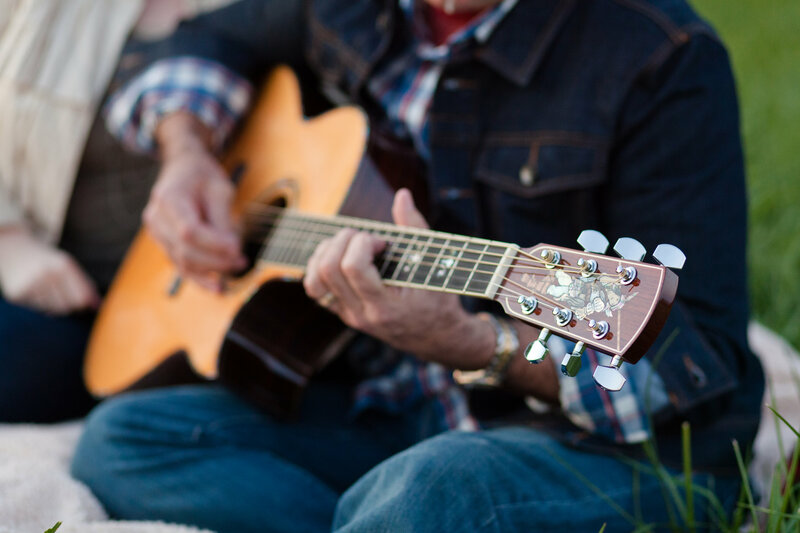 Enjoy these songs to help you celebrate the reason for Christmas - Jesus - and draw near to Him. Have a merry (and undone) Christmas! "When artistry meets discipleship, we worship where the Spirit meets truth."